FEATURES/SPECS This unique walnut and brass name bar will make your desk look like the CEO's desk, no matter your job title! It features a brushed finished gold plate base with cherry finish walnut feet. The feet have a felt line bottom to protect your desktop. 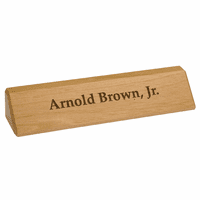 Cradled in this base is a piano finish walnut name bar that comes laser engraved with the inscription of your choosing. The most popular choice is the recipient's name and job title but you can get as creative as you'd like. 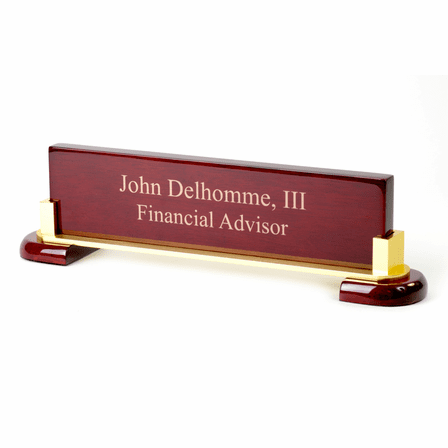 This personalized desktop name bar is an elegant, classic gift for a recently promoted co-worker or a loved one embarking on a new career. It comes packaged in a gift box and ships out within one business day. Dimensions: 12 14" x 3 1/2"
Are you able to engrave the scales of justice symbol on the front of the plate with the name? Is this name bar able to be engraved on both sides? Yes, just enter the engraving you would like on the back of the name bar in the comments section of our checkout page. do you have the capability of engraving a state seal on the left quardrant of the name bar? Need it by friday. We would only be able to engrave it if its in black and white adobe illustrator .eps format. If you have the seal image in that format, email it to help@executivegiftshoppe.com. 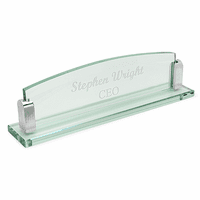 This desktop name bar is in stock so it would ship the next business day normally, even with engraving. This is a stunning piece. Came exactly as ordered and arrived quickly. It is beautifully engraved and more importantly my boss loved it! Absolutely perfect. My friend loved it. Received it on time and it looked great. I found the nameplates that I ordered arrived in a timely manner. I was very pleased with the product and the friend I bought it for loved it. I found them to be most professional, as they worked with me on an accidental duplicate purchase. I will be purchasing future items from Executive Gift Shoppe. Christmas gift from our Boss!! great piece we all love it!! 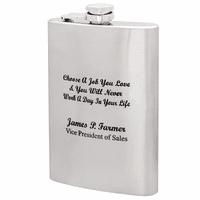 Great gift for anyone, we were all given one personalized with a quote on the back. we really love it!! 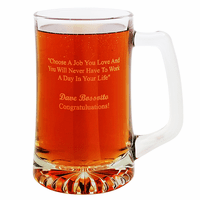 "Choose a job you love & You will never work a day in your life again"
I purchased this item for a co-work as a graduation gift. They loved it. I would recommend this item for young professionals. I was very impressed with the quality and overall presentation. Exceeded my expectation. This proved to be an excellent birthday/congratulations gift for my boss who was just elected as judge. Needed something out of ordinary, and the Exec Gift Shoppe delivered. This desktop name plate/or name bar is beautifully crafted and distinctive . A good weight and feel to it, classic piano finish. I will be back for future gift ideas..